For those residing in the UK, Zizzi would be a familiar name. It is one of the more successful European (Italian in this case) franchised chain of restaurants with the likes of other competitors such as Bella Italia, Carluccios, Cafe Rouge, that commands a presence in most if not all major cities in the UK. In the city centre of Leicester itself, there are already 2, one nestled at the new Highcross Shopping Centre, and the other (which is the one we frequent) is located along the high streets on Belvoir Street. We particularly favoured this particular branch of Zizzi owing to its interior decorations, which gave a very 'warm' feeling. Split over 2 levels, separated by a small flight of stairs, you could even witness your food being prepared before you by the chefs working at the open-concept kitchen. Attracted by their recent introduction of a new menu, 'Cichetti' (pronounced CHEE-KET-TEE), we decided to give it a try! It was basically a separate set of menu which offered a variety of dishes in smaller portions, compared to the usual offering, though there were some variations from the main menu in terms of food items. All items were charged at £4.95/dish universally, which really was designed for friends or couples alike for sharing. Not in the mood for heavy drinking, we started the evening light with a glass of Prosecco (Italian sparkling white wine) each. 'Chin chin! ', let the glasses clink away as the evening unfolds! It would be a sin really not to kickstart your meal with this fabulous starter.. Bread with tomato, basil and pine nut pesto. 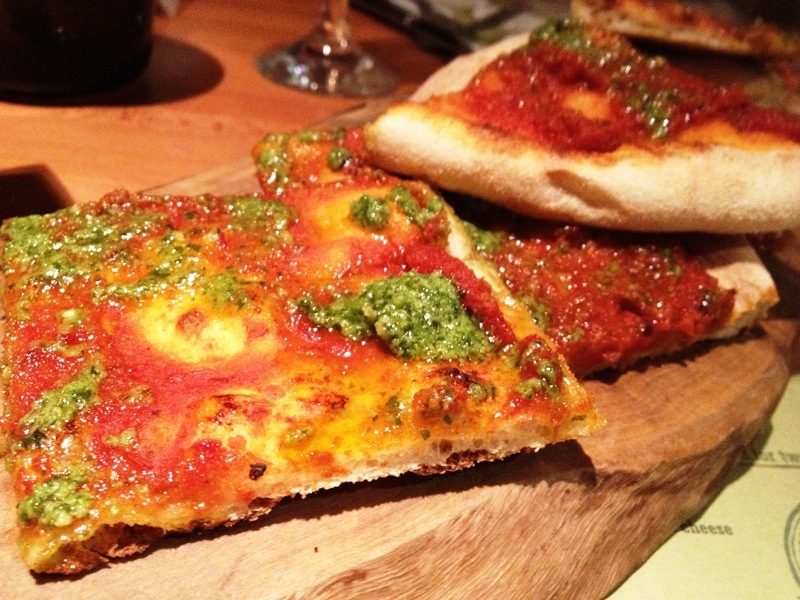 (+) Certainly very generous in serving, was more like a pizza main rather than starter. (+) The bread was freshly toasted, giving a sharp crisp to the bite. (+) The combination of tomatoes and basil went very really, exuding a strong fragrance. (+) Pesto was lusciously savoury, prime choice for starter. (+) It looked so good that the lady seated at the table next to us ordered it too! Now that we were done with the starters...let the cichetti be served! King prawns cooked in a fish and wine stock with a pinch of chilli, served with baked dough sticks. 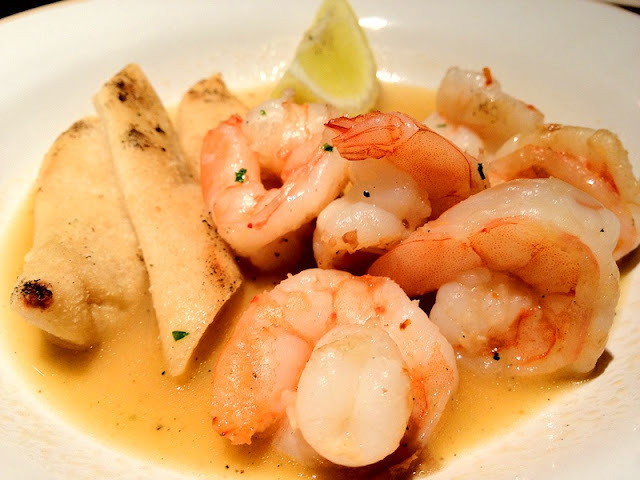 (+) The prawns were succulent, juicy and firm. Gives a slight crunch too to the bite. (+) Stock was a divine combination, especially when sprinkled with some lemon juice. (+) Dough sticks were the soft, yielding sort, slightly toasted. Consumed together with the prawn in 1 bite (and dipped in the stock) gave a varied mouthfeel of crunchiness and tenderness, coupled with a luscious flavoursome stock, couldn't help for extra serving. 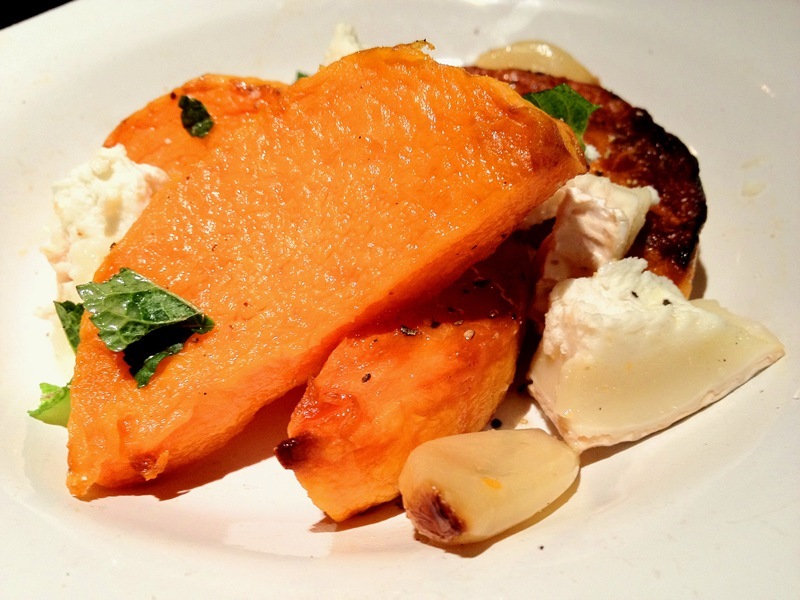 Oven-baked butternut squash with goats' cheese, sweet roasted garlic and mint. It was actually our first time tasting butternut squash, which is actually a type of winter squash. It has a sweet, nutty taste similar to that of pumpkin. Growing on a vine, the orange fleshy pulp turns increasingly orange, sweeter and richer in taste. (+) The ripeness of the butternut squash was prime, delivering a subtle natural sweetness. (+) Not overly cooked, still retained a rather firm texture, instead of mushy. (+) Think of oven-baked pumpkin, and you should roughly figure out the taste. (+) Contrary to popular belief, the goats' cheese served was not appalling nor repugnant. It was soft, mildly smoked and melted in our mouths. Two mini calzone; one with spicy n'Duja sausage and rocket; other with goats' cheese and pepper (vegetarian). 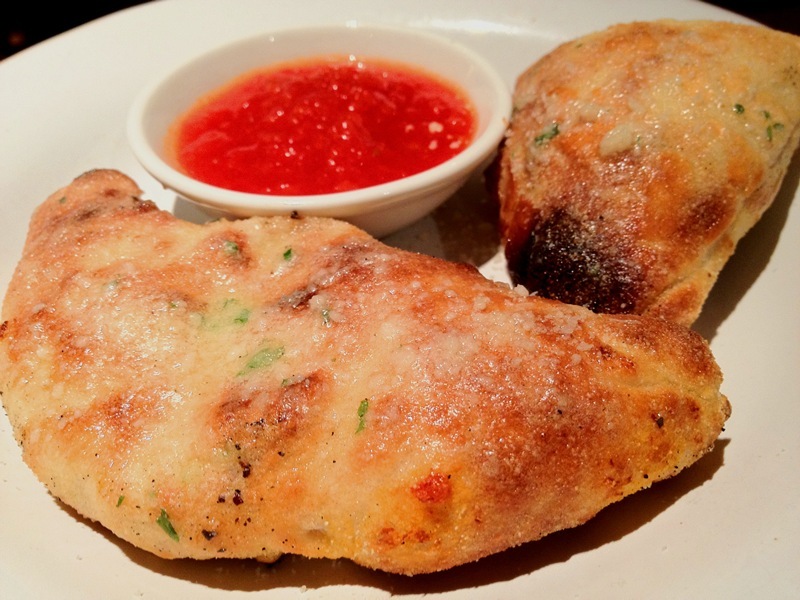 Calzone is actually a turnover that originated from Italy. (Think pizza folded into half) Also one of my favourite dishes in an Italian restaurant, it is shaped like a semi-circle, made of dough and filled with ingredients, common to that of a pizza. The smaller calzone featured in the picture above is the one with n'Duja sausage, while the larger calzone is vegetarian. I always endeavour to figure out what exactly am I putting into my mouth. Little did I realize that n'Duja sausage is actually made from pork, cos it smelled and resembled the taste that of beef. It is in fact made with different parts of the pig, such as shoulder, belly, jowl as well as tripe, roasted peppers and a mixture of spices, a Calabrian (place in Italy) variation of salami. (+) Ingredients were generous inside the calzone, and went well with the dip provided. (-) The crust was not as crispy as what I had expected it to be, which kind of defeated the whole purpose of ordering calzone. 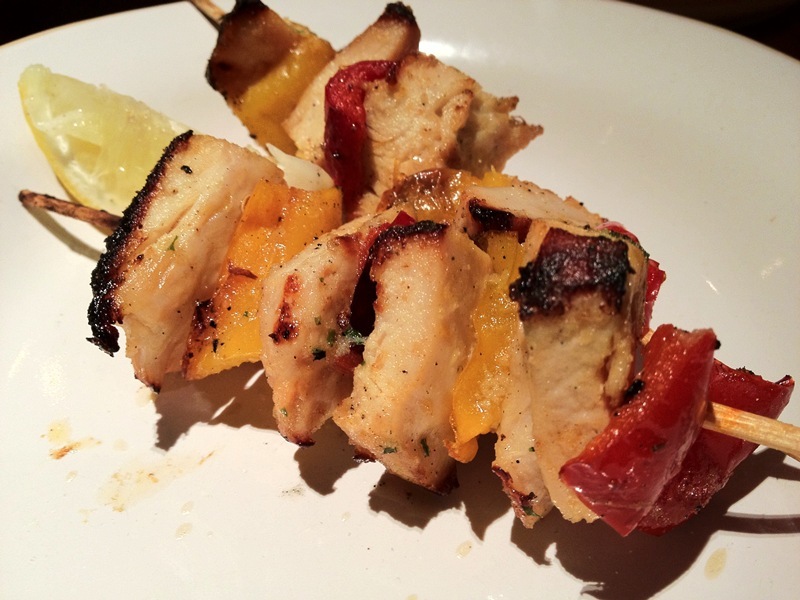 Oven baked chicken skewers with roasted peppers, rosemary and lemon. (+) Red and yellow peppers were crisp. Ingredients were fresh. (-) Being a fan of using rosemary in cooking, I could hardly detect any scent of it. (-) The chicken chunks were slightly overcooked, tasted too dry and 'stiff' for our liking. (-) Overall, a very mediocre dish, nothing too impressive. 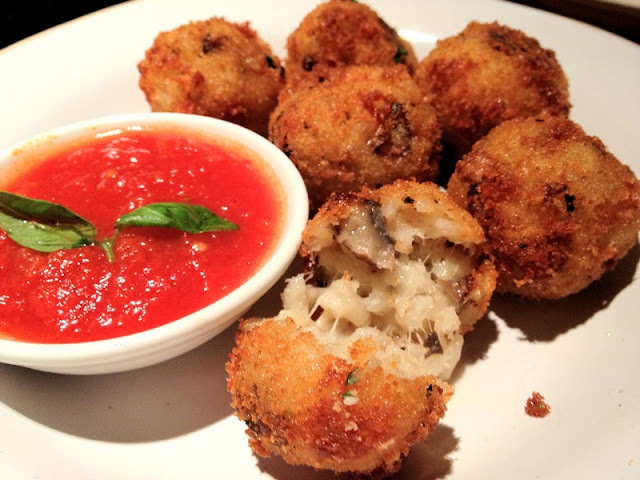 Mini risotto balls with mushrooms, mozzarella, thyme and rosemary, served with a pomodoro dip. This came as quite a surprise, cos we waited in anticipation how 'risotto balls' would look like. It certainly beat our expectations when it came as deep fried golden crispy balls. Creative. 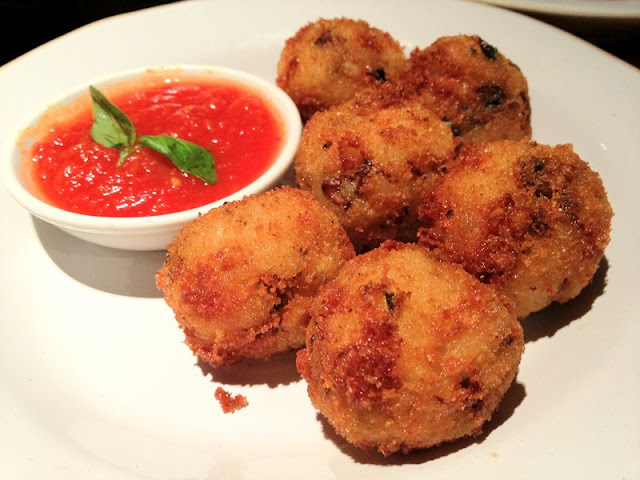 (+) Particularly enjoyed the varied texture, crispy exterior with a soft, mushy interior. (+) Appropriate amount of mozzarella used to make it a rich flavoursome bite, yet not too overwhelming to upset one's appetite with excessive cheese. (+) The dip (which tasted like salsa) complemented and enhanced the overall taste of the golden delicious balls very well. (+) Overall, a good balance of proportions of ingredients to make it a very gratifying treat. 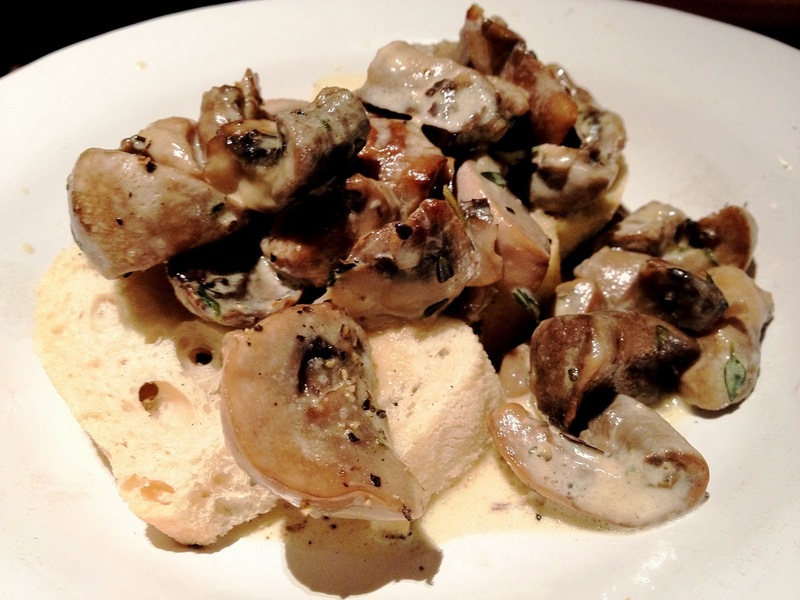 Mushrooms in a rich mascarpone, wine and thyme sauce, served on top of a mini ciabatta. (+) The flavours of the mascarpone, wine and thyme sauce were infused into the mushrooms. At first bite, it was bursting with rich flavourful juices. (+) Mushrooms were tender, yet not overly soft. (+) The toasted ciabatta was crisp and crumbles at first bite. (+) Mushrooms served on the ciabatta served a perfect varied mouthfeel, a simple yet beautifully composed dish. Limoncello is a type of lemon liqueur which originated from Italy. Traditionally made from zest of lemons (without the pith), it would be steeped in grain alcohol until the oil is released. The resulting yellow liquid is then mixed with simple syrup. The clarity and viscosity are affected by the relative temperatures of both liquids. It has an optimal alcohol content of about 32%. Like some of the other Cichetti dishes, we were waiting in anticipation for this lemon dessert, hopefully to round up our perfect Italian meal. Being a fan of lemon desserts, it would not be difficult to explain our excitement! (+) The lemon sorbet tasted very refreshing and strong in its lemon flavour. 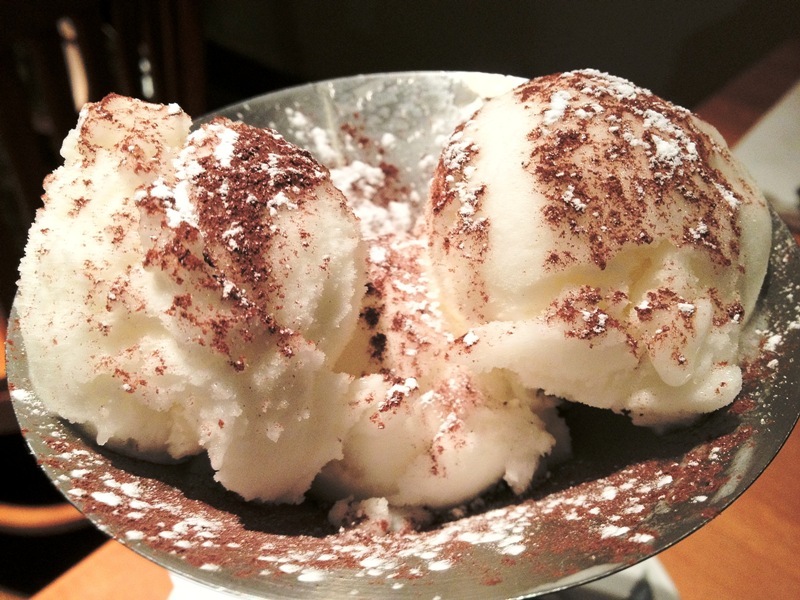 (-) The cocoa powder sprinkled on top of the lemon sorbet was a complete disaster to the flavours. We had to try to scrap it off the surface before tasting the sorbet on its own. (-) More importantly, we ordered this for I wanted to try Limoncello being introduced to the sorbet, however all that was tasted was a good serving of lemon sorbet, sorely lacking any liqueur taste nor fragrance. So far, our dining experiences at Zizzi had been more than satisfactory, though I must comment on their quality control over their calzones. I had by now tried all the different types of calzones served, and I still hope one day to taste the calzone which I first tried at Zizzi. Personally, the emphasis is on a good crisp crust, which sounds easy, but seemingly a hard to achieve feat for the chefs behind the counter. The server for our table was not very familiar with the new Cichetti menu and we overheard on a few occasions that she landed wrong orders for the diners beside us. Well, it was not a huge deal for me as long as the food was good and more importantly, it helped to bring a smile on my lady's face. That was itself worth it all. Having tried both the full menu dishes and now the Cichetti, I would most certainly recommend the latter if you enjoy tasting various dishes like us both. We would most certainly return to try out the other dishes.